When it comes to investing, there are different styles and approaches to suit the different palates and tastes of the investors. Still, despite the different variations, investing styles are often categorized into either being Value oriented, Growth oriented or Income oriented style of investing. An important aspect to remember is that each of these types or styles of investing has its own pros and cons. A value or growth based stock tends to be more cyclical in nature. The different turns in the economy tends to affect these two types of stocks differently. Historically, growth stocks are preferred in an expanding environment while value stocks fare better when the economy is showing signs of slowing down or just coming out of a recession. A typical investing portfolio is better suited to weather these downturns by building a balance of value, growth and of course income oriented investing. Each of these three types of investing of course has its own style of picking stocks. There is no "best investing strategy" and if there was one, the world would see a lot more millionaires than what we have now. What works however is in picking an investment style that suites one's style of investing and one that works best towards your investment goals. Picking an investing strategy only to abandon it later is often the cause why many investors fail to generate decent returns. The best way to overcome this is to look at the investing strategy in detail including past historical data to get an idea of what the particular investing style is all about. Quite often, it is easy to get carried away by reading about some fancy new or an old revived investing concept with glamorized graphs and promises of big returns. When picking an investing strategy, investors should focus on the returns and the risks that come with it. More often than not, investors focus only on the returns and ignore the other aspects such as the drawdown based on the investment style. Without know the drawdown, is like investing knowing just one side of the story. What you see on the other side is something you many not like. Investors are often faced with the dilemma of how or what investing style to choose. As mentioned earlier in this article, it is all about what type of investment one is looking at. The Dogs of the Dow and the S&P400 mid-cap stock index are actually two different investing styles. While one deals with large or mega-cap stocks and ones that are listed on the Dow Jones Index (and can be considered the crème-de-la-crème of the stock markets, the other stocks are young and growth oriented stocks. It is quite possible that a certain style of investors prefer to use the Dogs of the Dow method of investing, while on the other hand, you have investors who prefer to invest in the S&P400 mid-cap stocks. At the end, it is all about what an investor expects and the relative risk that they are willing to take that will determine which of these two styles of investing is better. Still, for those who are curious to know as to whether a safe, fixed income based stock investing offers better returns than a growth investing strategy, this articles explains in detail what is the Dogs of the Dow and the S&P400 mid-cap stock investing is all about. What is Dogs of the Dow investment strategy? The Dogs of the Dow is an investing strategy that gained prominent after the book, "Beating the Dow" was published by Michael Higgins in 1992. The strategy quickly became popular because of the simplicity involved in picking the stocks, which also happened to be its most attractive attributes. The Dogs of the Dow investing strategy is very simple and is based on 10 of the 30 companies listed in the Dow Jones Industrial Average (DJIA) sorted by the companies that offer the highest dividend yield. The Dogs of the Dow strategy simply rebalances and shuffles the portfolio so that the investments are equally distributed to each of the top ten highest yielding stocks. The Dogs of the Dow strategy is a bit of an active investment strategy as investors need to monitor the 30 stocks listed on the Dow and replace when dividend yields change. This would mean, replacing existing stock holdings with any new stocks whose dividend yields are higher than before. As one can expect, the Dogs of the Dow is a very simple investing strategy and because it focuses on the Dow 30 listed stocks, they are a safer bet compared to small or mid-cap stocks. With safe, often comes the question of returns. The chart below shows a comparison between the yearly returns based on the Dogs of the Dow style of investing versus the yearly returns from the Dow Jones Industrial Average. 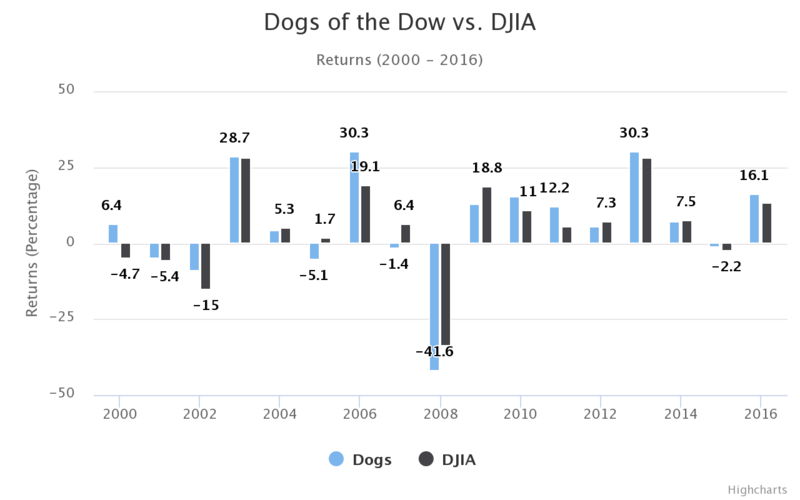 In a majority of the years, the Dogs of the Dow strategy has yielded better returns than simply investing in the Dow Jones industrial average. The Dogs of the Dow investment strategy focuses on the dividend payments, which some view as a safe way to build a portfolio based on fixed income payments. Thus, if one were to look for growth, the Dogs of the Dow investment strategy is not the place to be. One of the main reasons why the Dogs of the Dow investment strategy is not an aggressive investing strategy is because the 30 listed companies are large or mega-cap companies. Growth for these companies is hard to come by compared to mid-cap stocks, but at the same time, the Dogs of the Dow investment offers lesser risk compared to mid-cap stock picking. The Dogs of the Dow investment strategy is seen by many as an improvement from the Dow Laggards style of investing. 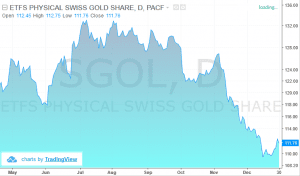 In this approach, investors pick up stocks that have fallen out of favor, also known as the laggards of the Dow. In this approach to investing, investors pick the stocks which are usually trading at a discount and then sell the holdings when the stock moves back into favor and rebounds with better market valuations. The Dogs of the Dow strategy due to its simplicity has given rise to many different variations spanning across other benchmark indexes as well. Examples include, the Dow 5 which focuses on the five Dow listed stocks that have the lowest share price and so on. What is the S&P400 Mid-cap market index? The S&P400 is the mid-cap stock index from Standard & Poors. The more famous sibling of the S&P400 is the S&P500. Similar to the composition of the S&P500, the S&P500 mid-cap stock index is comprised of mid-cap companies. Standard & Poor's define the S&P400 mid-cap stock as an index that provides investors with a benchmark for the mid-cap stocks listed in the U.S. It covers about 7% of the U.S. equity markets on the whole and is aimed at accurately reflecting the risks and returns from the mid-size companies. The S&P400 mid-cap companies have a market capitalization range from $200 million and up to $5 billion in market value. The chart below shows a comparison of the returns between the S&P500 (large-cap) and the S&P400 (mid-cap) from the year 2000. 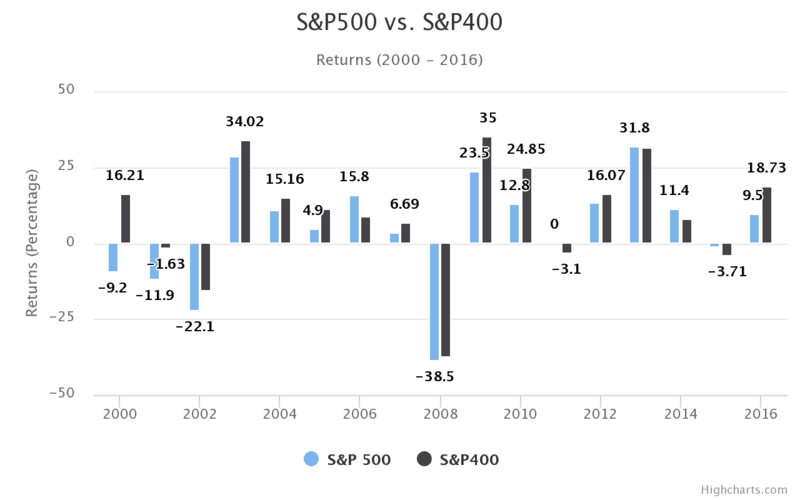 The above charts show how the returns from the S&P400 have in majority of the cases surpassed the returns from the S&P500. This is but obvious considering that the S&P400 index is made up of mid-cap stocks and thus, they tend to be more volatile but also known for generating higher returns compared to its large-cap peers. In the above years, the periods of 2007 – 2008 covers the bear markets in stocks. Although not widely talked about, compared to the S&P500, the mid-cap stocks from the S&P400 are often considered to be the balance between the large-cap and the small-cap companies. Some of the big and explosive stock movements often comes from mid-cap stocks as they are positioned in a rather sweet spot and are prime targets for mergers and acquisitions by its bigger sibling the S&P500 listed companies. While the mid-cap stocks are well positioned for growth, they are also vulnerable to the economic changes or industry down turns. However, the way the mid-cap stocks face these obstacles can be vary depending on the company and the industry. While mid-cap stocks might make one to believe that such stocks are not as popular compared to the large-cap stocks, on the contrary, some of the common stock names one gets to hear are mid-cap listings. Examples include Best Buy (NYSE: BBY), Nordstrom (NYSE: RIG), Buffalo Wild Wings (NASDAQ: BWLD) and Bed Bath & Beyond (NASDAQ: BBBY). Thus, mid-cap stocks are not some vague stocks that are shunned by investors but in fact some of the well known and common household names. So far, we have seen the S&P400 mid-cap stocks have clearly most of the times outperformed the S&P500 in terms of returns. It should be obvious by now to expect what kind of comparison one can see when comparing the returns from the Dogs of the Dow and the S&P400 index. The above chart shows the S&P400 clearly head and shoulders above the returns from the Dogs of the Dow investing strategy and understandably so. When it comes to investing in the S&p400 mid-cap stock, investors can look at simply purchasing an ETF such as the iShares Core S&P Mid-Cap (IJH) which tracks the performance of the S&P400 mid-cap index. In terms of convenience this is a better option compared to the Dogs of the Dow investing which requires a more active approach. Of course, there are alternatives such as investing in the Dogs of the Dow tracking ETF’s such as the DOD, which simply involves buying the ETF, as compared to actively managing the stocks listed on the Dow Jones Index. The chart below shows a comparison between the IJH and the DOD ETF’s to get some idea on the ETF’s performance. Of course, between the two, the expense ratio for DOD is much higher at 0.75% compared to 0.07% for the IJH ETF. When it comes to finding the right investment strategy, a lot of things come together in ultimately determining what type of investment strategy you would use. While a safe, fixed income style of investment is the best approach when you reach towards retirement, for young executives, a mix of aggressive growth oriented investment style is a better bet. Should you be investing in Dogs of the Dow or the S&P400 Mid-Cap stocks? The answer to this of course is not as straight forward as one might think. Looking at merely investment yields to justify which of the two is better is not the right way when it comes to assessing how good or bad an investment strategy or style is. Rather, it is a question of whether the investing style meets the investor’s expectations for returns that eventually determines when a particular investment style is a good fit or not. 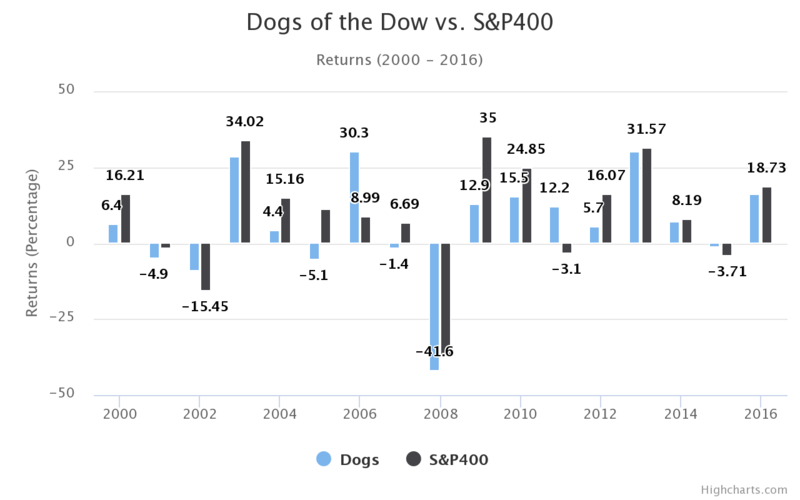 In the above article, the Dogs of the Dow style of investing is certainly distinct compared to investing in the S&P400 mid-cap stocks. While one style of investing focuses on the large and mega cap Dow listed stocks, the other focuses on mid-capitalized stocks, which may not be as safe as the Dow components but have higher growth potential. For an investor who is retired or nearing retirement and has a lot more time on their hands, the Dogs of the Dow might seem like a safe bet with the ability to actively manage the stocks, while on the other hand a young professional who is just starting out in life will prefer to focus on investing in an aggressive growth oriented style of investing. At the end of the day, it is up to the investor’s risk tolerance and the investing goals that will eventually determine which of these two methods to investing in.